3 May 2007: Disproportionate growth of the world's urban population could result in further loss of many forms of life on Earth, warn experts in the sciences of climate change and biodiversity. Nearly 200 years ago, London was the only city in the world with more than one million people. Today, across the globe, there are more than 400 cities of at least that size. While these cities occupy only two per cent of the planet's surface, according to the United Nations report, World Population Prospects, their residents are responsible for at least 75 per cent of the resources consumed by the global population, including a huge quantity of fossil fuels. Climate change is one of the main forces responsible for the enormous loss of biodiversity on Earth, say scientists specialising in these fields. Long-term changes in average temperatures can dramatically alter the habitats that provide life support for plant and animal species. With more than 3.2 billion people residing in the cities, for the first time the world's urban population now exceeds the number of those living in rural areas. Since their appearance on earth, human beings have never destroyed the web of life as much as during the past 50 years, according to the UN's Millennium Ecosystem Assessment report. It shows that before the industrial era, nearly 47 per cent of the Earth's land surface was covered with forests; today the planet is left with only 10 per cent of that. "We are consuming more natural resources than can be regenerated," says Ahmed Djoghlaf, executive secretary of the UN Convention on Biological Diversity. "We are living beyond the means and capacities of our planet." The 2007 report, which involved more than 1,300 scientists from 95 countries, says that every year about 10 million hectares of world's forest are lost to unsustainable modes of economic development. 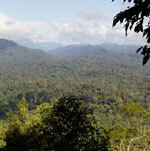 A large part of the world's forests are located in tropical regions, where biodiversity thrives in abundance. These forests are home to about 80 per cent of the plant and animal species, even though they cover only seven per cent of the planet's surface, according to the report, which concludes that in addition to causing coastal erosions and a decrease in agricultural productivity, global warming will also end up killing many more plant and animal species in the next few decades. Scientists say plant and animal species are now disappearing 100 to 1,000 times faster than the natural pace of extinction. Statistics on the loss of biodiversity suggest at least 20 per cent of bird species have already completely vanished and that 23 per cents of mammals, 25 per cent of conifers, 32 per cent of amphibians, and 52 per cent of cycads (a family of evergreen plants similar, but unrelated, to palms and ferns) continue to face serious threat of extinction. Djoghlaf and the scientists involved in the report agree that the planet's biodiversity loss demands urgent action, otherwise by the middle of this century about one-fifth of the world's plant species may be doomed to disappear. Under the UN Convention on Biological Diversity, signed by 188 countries, governments are required to take certain steps that would "significantly reduce" biodiversity loss by the year 2010. However, a number of poor countries in the world remain far behind in executing plans aimed at reversing species loss, due in part to the rapid growth of unplanned urbanisation. Several of these developing countries also happen to be the richest in terms of biodiversity. For example, every day, thousands of rural poor in India move to big cities where there are few environmental policies in place. Though they have come in search of a better life, many eventually end up living in slums, with no access to safe water or sanitation facilities. Yet, they add to the increasing demands of the city population for food and energy. According to the UN population surveys, India is likely to have 700 million rural poor moving to the cities by 2050 if the current trend is not reversed in the next few years. With 45,000 plant and nearly 90,000 animal species, India is considered one of the world's most mega-diverse countries. Experts say the continued growth in its urban population could lead to enormous loss of biodiversity. Yet, so far, the country has failed to show serious planning efforts to address the impact of increased urbanisation on the environment. Djoghlaf notes that China, Indonesia, and South Africa -- three additional mega-diverse developing countries -- are also confronted with a similar situation, where urban planners have failed to incorporate environmental concerns. However, Brazil, one of the world's most mega-diverse developing nations, home to more than 56,000 plants species, has taken the lead in setting new trends in urban planning. 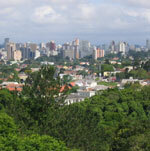 Its "green city" Curitiba has demonstrated that urban planning can and should be environmentally friendly. Curitiba's population of 1.8 million consumes 23 per cent less fuel per capita than the Brazilian national average. The city has 16 parks, 14 forests, and over 1,000 green public areas shared by its residents. Curitiba recently hosted an international gathering of mayors from all over the world to showcase its contribution to the global agenda on biodiversity in general, and green urban planning in particular. "Cities are not the problem, they are the solution," Jamie Lerner, one of the architects involved in planning the city's ecologically-friendly landscape, told his counterparts at the meeting. Lerner asserts that unsound urban management is not the unavoidable destiny of cities, and that urbanisation and ecology can coexist, but, according to him, that demands increasingly active participation from all the stakeholders, including the public and private sectors, as well as ordinary citizens. Some leading environmental experts suggest that in many parts of the developing world, policymakers at the local and national level are failing to devise and execute environmentally sound policies because they are not closely in touch with the scientific community. For example, Robert Watson, who led the Intergovernmental Panel on Climate Change (IPCC) from 1996 to 2002, and now works at the World Bank, thinks that any drastic change in policy making to address environmental concerns is unlikely to occur unless the experts on climate change and biodiversity take the initiative to reach out to governments. "For the sake of the planet," says Watson, "the biodiversity science community has to create a way to get organised to advise governments to halt the potentially catastrophic loss of species." But Djoghlaf believes that sharing the burden of responsibility also demands that local policymakers and administrators start paying close attention to the issue of biodiversity preservation and put their thoughts into action. "The cities will determine the fate of the remaining biodiversity of our planet," he says. "The battle for life will be won or lost there."